Over Labor Day weekend, my husband took the kiddos camping with my son's Cub Scout pack, so I had a glorious 3 days and 2 nights to myself in my home. After sitting in silence (glorious silence!) in my house for about an hour, I got dressed and loaded up my gear to head out for a weekend of photography projects that I'd had on my radar for a while. I need some new images for my Offset catalogue (Offset is an elite professional stock agency for which I am a contributing artist). On the North Shore of Oahu, after driving through the picturesque and historic Haleiwa town, down the two-lane road that hugs the shoreline, you'll come to Waimea Bay. The bay is a gorgeous expanse of water dotted by giant boulders left behind by Pele when she sculpted the island from lava and fire. In the winter, the waters here are turbulent, giant swells pounding the shores with a rumble that echoes through the mountains behind the bay; but in the summer, the waters are calm and smooth, and the large boulders are a favorite of locals and tourists alike, who climb them with the intent of diving into the cool ocean waters below. I planned my trip to the bay around sunset, pulling into the parking lot as a procession of slightly-sunburned beach-goers headed in the opposite direction, pulling wagons of sand toys and tired children. Despite the late hour, there were still plenty of adventurous tourists and local teens scaling the rocks and lining up to leap from the edge of the jagged boulders into the gently-rolling waves below. After capturing the action on the rocks, I moved down the shoreline to capture a few landscape images of the bay and the scenic coastline. I happened to look back toward the boulders and noticed that the crowd had thinned, leaving just one woman standing on the top, looking so calm and quiet as she contemplated the beauty around her. 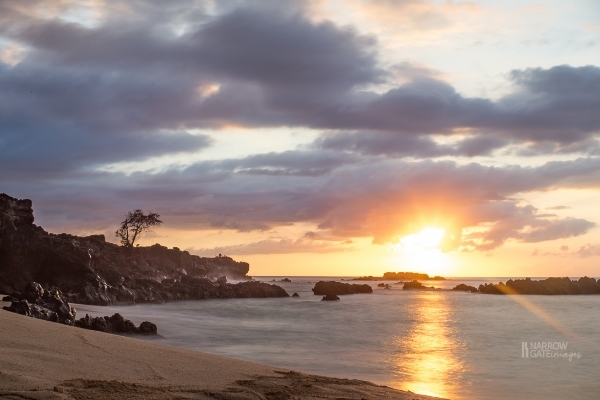 If you have the opportunity, I would highly recommend checking out Waimea Bay. Far past the hordes of tourists on Waikiki Beach, it is a place of amazing beauty and light-hearted fun. 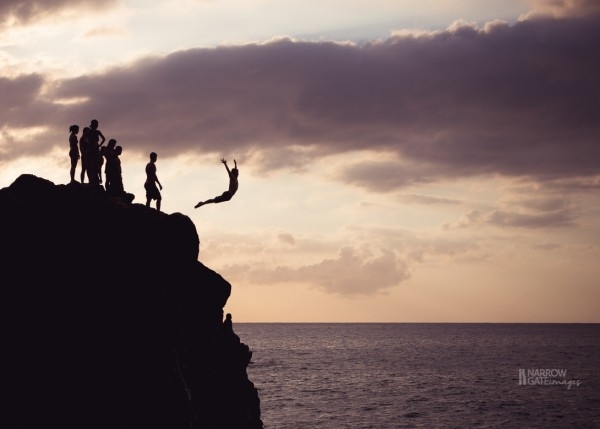 If you'd like to jump, be certain the conditions are safe to do so (you can always ask the lifeguards to be safe), but it is great fun and a rite of passage for many Hawaiian youth. And although winter wave patterns prohibit jumping (and often, even swimming in the bay), it is still a gorgeous location to capture a sunset from the comfort of a beach blanket, preferably with a glass of wine in hand.